The Stefansson Arctic Institute (SAI) organizes various events whereof the most important are mentioned below. 2018 Stefansson Memorial Lecture will be held at the University of Washington, Seattle, December 5, 2018 (CMU 120, 15.30-17.00). Professor Leslie King at Royal Roads University in Canada presents the lecture. Title: Learning from Northern Peoples. The lecture is open to the public. The Stefansson Arctic Institute and the Institute of Arctic Studies at Dartmouth College, supported by the Evelyn Nef Stefansson Endowment, sponsor the annual lecture. The lecture is commemoration of the explorer and anthropologist Vilhjálmur Stefansson - his life, work and vision for the Arctic. On 1 September 2018 a meeting took place of the ICECHANGE project at Hannesarholt in Reykjavík. All five ICECHANGE members took part: Astrid Ogilvie (SAI); Árni Daníel Júlíusson (Reykjavík Academy and University of Iceland); Jón Haukur Ingimundarson (SAI and University of Akureyri); Steven Hartman (Mälardalen University); and Viðar Hreinsson (SAI, Natural History Museum of Iceland and Reykjavík Academy). The project is led by Astrid Ogilvie and co-led by Steven Hartman. The meeting discussion focused on upcoming deliverables; in particular, a summary of previous work and a project bibliography as well as planning for future meetings. An invitation to contribute a co-authored ICECHANGE volume to the series New Directions in Sustainability and Society (Cambridge University Press) was also discussed. The idea was also suggested to contribute to a session at the Arctic Workshop of the Institute of Arctic and Alpine Research (INSTAAR) to be held in Stockholm during 4-5 April 2018. This will be followed by a project meeting at Sigtuna during 7-9 April 2018. Prior to this, the next ICECHANGE project meeting will be held at the Sigtuna Foundation, Sweden, during the week of 29 October—2 November 2018. This will be preceded by the annual leadership meeting of the Humanities for the Environment Global Observatories and the launch workshop of the HfE Circumpolar Observatory (Convenor Steven Hartman). For further information see https://hfe-observatories.org/observatories/circumpolar-observatory/. The hub of the Observatory is the Stefansson Arctic Institute (SAI). ICECHANGE members are also involved in these activities and will attend these combined meetings, which will be held during 26-28 October 2018. Twenty-six team members and invitees from the Nordic Centre of Excellence project Arctic Climate Predictions - Pathways to Resilient, Sustainable Societies (ARCPATH) met at the Nansen Environmental and Remote Sensing Centre (NERSC) in Bergen, Norway during 6-7 September 2018 for the annual project meeting. The meeting was organised by: Yongqi Gao (ARCPATH leader, NERSC); Astrid Ogilvie (ARCPATH co-leader, SAI); and Kjetil Lygre, Project Manager at NERSC. The meeting was also attended by Kyösti Lempa, Senior Adviser, representing NordForsk, and by two members of ARCPATH´s own Advisory Board, Lawrence C. Hamilton, Professor of Sociology at the University of New Hampshire, USA and Dr Burkhardt Rockel of the Helmholtz-Zentrum Geesthacht Institute for Coastal Research, Germany. Welcoming remarks were given by Dr Sebastian H. Mernild, Managing Director of NERSC: The meeting was opened by Yongqi Gao and Astrid Ogilvie with a reminder of ARCPATH goals. Kyösti Lempa: NordForsk perspectives on ARCPATH; Astrid Ogilvie: Back to Basics: Historical Climate Research; Nour-Eddine Omrani: Simulated multi-decadal climate variations in the Atlantic-Arctic Sector; Torben Koenig: Fundamentals of Climate Modelling; Noel Keenlyside:Introduction to WP2; Madlen Kimmritz: How to Improve Sea Ice Prediction Using Sea-Ice Observations; Tian Tian: Development of the EC-Earth decadal prediction system in ARCPATH; Fumiaki Ogawa: Drivers of the North-Canadian and Greenland Decadal Warming Trends; Torben Koenigk: Results and Plans for WP3; Marianne Rasmussen and Níels Einarsson: Introductory Remarks: Status and Goals for WP4; Olli Loisa: Distribution and Abundance of Small Cetaceans in Skjálfandi Bay and Eyjafjörður, Northern Iceland; Anniken Førde: Whalefeast: The Urge for New Knowledge Dialogues; Brynhildur Daviðsdóttir, David Cook and Laura Malinauskaite: One Year In: Valuing Arctic Ecosystem Services; Níels Einarsson: Introductory Remarks: Status and Goals for WP5; Catherine Chambers: Fisheries Governance and the Contribution of Social Science: Reflections on Basics; Guest Lecture: Larry Hamilton: Demographic Variations and Change in the Inuit Arctic; Guest Lecture: Burkhardt Rockel: Basic Concepts in Dynamical Downscaling; Kjetil Lygre: WP 7 Project management (including status, key numbers, deliveries, milestones, outreach, links to other projects). In addition to the individual presentations, a group discussion took place on synthesis and future goals and collaboration between different project elements. A further group discussion regarding ARCPATH´s annual report for 2017 and comments from the NordForsk Scientific Advisory Board was moderated by Professor Hamilton. Reports on activities included a video film from the successful ARCPATH Summer School Climate Teleconnections and Predictions: Past, Present and Future held in Norheimsund, Norway, from 30 June to 6 July 2018 and attended by 33 students. SAI´s Astrid Ogilvie gave two lectures to the School. In September of 1871, 32 whaling ships were caught in the ice along the shore of the Arctic Ocean in Alaska. More than 1200 people were stranded. The raging winds and grinding ice surrounding them made survival only a remote possibility. An event of historical significance, leading to the end of Yankee Whaling in the early 20th Century. In 2015, a team from the US National Oceanic and Atmospheric Administration’s (NOAA) Maritime Heritage Program went back to this place to try to write the final chapter of this compelling story of whaling history. Seminar and Roundtable discussion, Nordic House, Reykjavík, 14:00 – 16:45. Open to the public. Date: 15 May 2018. Time: 14:00 – 15:00. Opening remarks: Mr. Guðlaugur Þór Þórðarson, Minister for Foreign Affairs, Iceland. Chair: Helga Ögmundardóttir, Assistant Professor, University of Iceland. Coffee and refreshments: 15:00-15:15. Roundtable discussions: 15:15 – 16:45. Chair: Jón Haukur Ingimundarson, Senior Scientist, Stefansson Arctic Institute, and Associate Professor, University of Akureyri. 16:45 Reception hosted by the Ministry for Foreign Affairs, Iceland. This event is organized by the Ministry for Foreign Affairs; Indigenous Peoples´ Secretariat; Icelandic Arctic Cooperation Network; Centre for Arctic Policy and Security; Stefansson Arctic Institute. An interdisciplinary course is offered in the Environmental Humanities and Social Sciences, located at Bárðardalur, northern Iceland, connecting local communities and issues with global developments, studying the Lake Mývatn area and the Bárðardalur valley on the banks of the glacial Skjálfandafljót river with its magnificent waterfalls. The course encompasses a unique blend of lectures and experiences of cultural histories embedded in landscapes. Aimed at masters and doctoral-level study, this summer course based at the northern edge of the Icelandic highland wilderness addresses questions of long‐term societal resilience in the face of changing climate and society, natural resources, effects of early globalization and anthropogenic transformation of landscapes and ecosystems. The course also welcomes professors and scholars looking for new insights and inspirations in post-and transdisciplinary methods. The course is co-organized by: The Svartárkot Culture-Nature Project; The Reykjavik Academy; the City University of New York; and the Stefansson Arctic Institute, in cooperation with NABO (The North Atlantic Biocultural Organisation); NIES (The Nordic Network for Interdisciplinary Environmental Studies); GHEA (The Global Human Ecodynamics Alliance); and the Circumpolar Networks case of IHOPE (The Integrated History and Future of People on Earth), a core project of Future Earth. An international group of academics has nominated the Arctic Council for the Nobel Peace Prize, see here. The Arctic Human Development Report (2004) is among the Arctic Council projects listed in the nomination letter to the Norwegian Nobel Committee. The report was a priorty project during the Icelandic chairmanship of the Arctic Council 2002-2004 and co-lead and published by the Stefansson Arctic Institute. See report here. Nunataryuk relies on the involvement of 28 partner institutions in 12 countries, Stefansson Arctic Institute being one of them. This is a five years project (2017-2022). Retreating permafrost coasts threaten the fragile Arctic environment. The EU project Nunataryuk will determine the effects of permafrost thaw on Earth’s coldest shorelines. More information here. The 2017 Stefansson Memorial Lecture was held as a contribution to the opening programme of a new interdisciplinary Arctic Research Centre (CER-ARCTIC) at the Autonomous University of Barcelona. The Centre is the first of its kind in Spain. The lecture is a joint project of the Stefansson Arctic Institute and the Institute of Arctic Studies at Dartmouth College, NH, USA. The lecture was delivered by Professor Brynhildur Davíðsdóttir, Environment and Natural Resources, Department of Economics, and Department of Life-and Environmental Sciences, University of Iceland. Title: The Value of the Arctic. The TOPtoTOP Global Climate Expedition, a family of climate explorers, stays for the winter in Akureyri on their 50-foot sailboat, the S/V Pachamama. Dario and Sabine Schwoerer and their six children have spent 16 years sailing all of the world’s seven seas, setting foot on seven continents, and climbing six of the world’s highest mountains, in an effort to witness, document, and report on climate change and its solutions. Dario Schwoerer gave a lecture in Borgir at the University of Akureyri campus on 10 October 2017 in preparation for the 2017 Arctic Circle Assembly. On Thursday, 9 March 2017, Dr Astrid Ogilvie, gave a lecture named Sagas and Science: Documentary Evidence of Changes in Climate and Sea-Ice Incidence in Iceland from the Settlement to the late 1800s at the University of Iceland Centre for Medieval Studies. 2016 Stefansson Memorial Lecture was held at Dartmouth College, USA, November 3, 2016. Hugh Beach, Professor Emeritus of Ethnology, Uppsala University, Sweden called his lecture Managing the Wilderness: Arctic Perspectives. More information here. 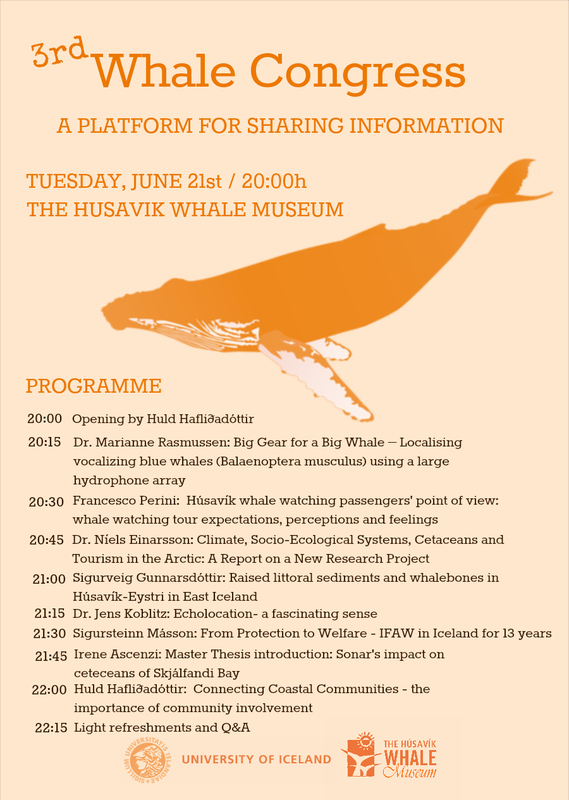 The third Whale Congress in Húsavík took place on Tuesday 21 June 2016. Dr. Níels Einarsson, director of the Stefansson Arctic Institute was among speekers. See programme here. Lecture by Dr. Anne-Marie Brady, Professor of Political Science at the University of Canterbury, Christchurch, New Zealand given on June 20 in Borgir, Akureyri. The lecture was hosted by the Stefansson Arctic Institute. The sail-off meeting of Nordic Center of Excellence Arctic Climate Predictions: Pathways to Resilient, Sustainable Societies (ARCPATH) took place at Nansen Environmental and Remote Sensing Center (NERSC) during April 11 and 12, 2016. ARCPATH is funded by the Nordic Council and includes nine partners from Norway, Denmark, Sweden and Iceland in addition to Canadian, Chinese, Russian and US partners. Representatives from partner institutions discussed the coordinated implementation plan for ARCPATH during two days in Bergen. Scientists from the Stefansson Arctic Institute participate in the project. See more here. The Stefansson Arctic Institute, the University of Iceland, and the Icelandic Arctic Cooperation Network are Icelandic representatives in ´ARCPATH´ - a NordForsk-funded Nordic Centre of Excellence in Arctic Research. The international and multidisciplinary project Arctic Climate Predictions: Pathways to Resilient, Sustainable Societies (ARCPATH) is one of four, out of 34 applications, to be awarded a grant of 28 million NOK for 5 years as a NordForsk Nordic Centre of Excellence in Arctic Research. The project’s home and leadership will be shared by the Nansen Environmental and Remote Sensing Centre (NERSC) in Bergen (Dr Yongqi Gao as lead) and the Stefansson Arctic Institute (Dr Astrid Ogilvie as co-lead). Icelandic representatives include: Dr Níels Einarsson, Director of the Stefansson Arctic Institute (SAI); Dr Edward Huijbens, Professor at the University of Akureyri and Senior Scientist at SAI; Dr Marianne H. Rasmussen, Director of the University of Iceland Research Centre in Húsavík; Dr Brynhildur Davíðsdóttir, Professor at the University of Iceland and Director of the School of Environmental and Natural Resources; Tom Barry, Executive Director of CAFF; and Embla Eir Oddsdóttir, Director of the Icelandic Arctic Cooperation Network and researcher with the SAI. Norway: The University of Bergen (UiB); The Arctic University of Norway (UiT); and The Norwegian Institute for Air Research (NILU). Denmark: The Danish Meteorological Institute (DMI). Sweden: The Swedish Meteorological and Hydrological Institute (SMHI). Other International Collaborators: Professor Leslie King, School of Environment and Sustainability, and Director, Canadian Centre for Environmental Education, Royal Roads University (RRU), Canada; Professor James R. McGoodwin, Department of Anthropology, and the Institute of Arctic and Alpine Research (INSTAAR), University of Colorado, USA; Dr Shari Fox Gearheard, National Snow and Ice Data Center (NSIDC), Colorado; Professor Sergey Gulev, P.P. Shirshov Institute of Oceanology, Russian Academy of Science (IORAS), Russia; Dr Vladimir Semenov, Institute of Applied Physics of the Russian Academy of Science (IAPRAS), Russia; Professor Ke Fan, Institute of Atmospheric Physics, Chinese Academy of Sciences, China; Professor Guðrún Magnúsdóttir, Chair Earth Systems Science, University of California; Dr Michael Karcher, Alfred Wegener Institute for Polar and Marine Research, Germany; Dr Baoqiang Tian, Nansen-Zhu International Research Centre, China; Dr Francois Massonnet, University College London, UK; Professor Gunhild Hoogensen Gjørv, University of Tromsø, The Arctic University of Norway (UiT); Professor Rasmus Gjedssø Bertelsen, Barents Chair in Politics, University of Tromsø, The Arctic University of Norway (UiT); Dr Yvan Orsolini, Senior Scientist, Norwegian Institute for Air Research, Norway; Professor Cecilia Bitz, University of Washington, USA; Dr Burkhardt Rockel, of the Helmholtz-Zentrum Geesthacht Institute for Coastal; Lawrence C. Hamilton, Professor of Sociology at the University of New Hampshire, USA; Michael Bravo, Fellow of Downing College, and Senior Lecturer, Department of Geography, University of Cambridge, and Head of the Circumpolar History and Public Policy Research Group at the Scott Polar Research Institute, Cambridge. The ARCPATH project seeks to combine improved regional climate predictions with enhanced understanding of environmental, societal, and economic interactions in order to supply new knowledge on Arctic "pathways to action". This will be achieved through extensive cross-disciplinary collaboration including: climatology (regional and global modelling; dynamic downscaling; historical climatology); environmental science; environmental economics; oceanography and cryosphere research; marine and fisheries biology; fisheries management; anthropology; governance systems; human eco-dynamics; and traditional ecological knowledge (TEK). Drawing on these separate but interlinking disciplines will enable ARCPATH to form a truly synergistic centre of excellence where the overarching goal is to foster responsible and sustainable development in northern communities. The Stefansson Arctic Institute is also a part of Resource Extraction and Sustainable Arctic Communities (REXAC) that is another project awarded NordForsk funding for a Nordic Centre of Excellence in Arctic Research. The SAI participant is Senior Scientist and Research Director Dr Joan Nymand Larsen. Research on the climate of the past 1000 years has tended to focus on two periods that have come to be known as the "Medieval Warm Period" or "Medieval Climatic Optimum" and the "Little Ice Age". As new palaeoclimatic proxy data are developed and refined it becomes increasingly clear that such terms are inadequate to describe climatic periods that varied considerably in time and space (Ogilvie and Jónsson, 2001). A recent study by Young et al. (2015) has suggested that the Norse settlement of Greenland around AD 985 occurred at a time when glaciers in southern Greenland were advanced, and that they continued in this phase for the entire period that the Norse remained (to ca. AD 1450). This undermines the climate deterministic theory that the Norse went to Greenland during a period of favourable climate, and died out when it became colder. In "Inside Climate News", the Stefansson Arctic Institute‘s climate historian, Dr Astrid Ogilvie, suggests that the new study provides further evidence for the climatic complexity of the period when the Norse remained in Greenland and that the term "Medieval Warm Period" is an unhelpful misnomer. Dr Níels Einarsson, director of the Stefansson Arctic Institute, appeared on a BBC Radio 4 programme contributing with research findings on whale watching, changes in Arctic coastal communities and socioeconomic impacts of tourism, in a series called Natural Histories, in an episode on Whales. The New Arctic, edited by Birgitta Evengård, Joan Nymand Larsen and Øyvind Paasche was recently published by Springer. See more information. Two new reports were published in February and can be downloaded from the NCM page (click on titles below). Dr Joan Nymand Larsen, scientist at the Stefansson Arctic Institute, is one of the editors. The Stefansson Memorial Lecture is an annual event established by the Stefansson Arctic Institute honoring the legacy of arctic explorer and anthropologist, Vilhjálmur Stefánsson (1879-1962). The lecture this year was given by Dr James White, a noted climate scientist working on abrupt climate change, sea ice and sea-level changes, and carbon cycles. The title of the lecture was Abrupt Change: Past, Present and Future:The hard reality and silver lining in a sustainable future. Place: Institute of Arctic and Alpine Research (INSTAAR), University of Colorado, USA. This conference focused broadly on the living condition of women and men throughout the Circumpolar North, addressing key issues such as access to and control over resources, representation in decision-making positions, political participation, regional development, human security, and material and cultural well-being. The Stefansson Memorial Lecture is an annual event established by the Stefansson Arctic Institute honoring the legacy of arctic explorer, anthropologist, and former Dartmouth faculty member Vilhjálmur Stefánsson (1879-1962). The lecture this year was given by anthropologist Thomas McGovern, Hunter College, City University of New York, at Dartmouth College, Tuesday 29 October 2013. The title of the lecture was Sustainability and Collapse in the Norse North Atlantic: Implications for Climate Adaptation Today. An Arctic event focused on the life of Vilhjálmur Stefansson and the 100th anniversary of the Canadian Arctic Expedition of 1913 was organized on November 5, 2013, titled Science, People & Sustainability in the Canadian Arctic: From the 1913 Canadian Arctic Expedition to the 2013 Arctic Council Chairmanship. This event traced the legacy of the Canadian Arctic Expedition, launched in 1913, and its leader Vilhjalmur Stefansson, in his day one of the most colorful and notorious students at UND. Speakers drew on Stefansson’s work and influences to examine new linkages between the United States and the Canadian Arctic. The 2013 NABO (North Atlantic Biocultural Organisation) General Meeting was hosted by the Stefansson Arctic Institute and held in Borgir Research Building on the campus of University of Akureyri on July 12th and 13th 2013. Two days of presentations and discussion were followed by an optional all day bus tour to archaeological sites and volcanic scenery around lake Mývatn on Sunday July 14th. The ASI-II report was launched at the Arctic Council Swedish Ministerial Meeting on 15 May 2013 in Kiruna, Sweden. The report will later be available in print and downloadable from web. The ASI Secretariat is situated with the Stefansson Arctic Institute and Dr. Joan Nymand Larsen was the project manager and co-editor of the report. A conference that focused on the fishing environment in northern territories took place in the University of Akureyri, 18-19 June 2013. The conference was organised by the Stefansson Arctic Institute in collaboration with the University of Akureyri Research Centre, NORA, the Icelandic Tourism Research Centre, Norwegian Seafood Centre and the Icelandic Lighthouse Society. Marine and coastal culture tourism is growing in popularity in various ways. Some tourists want to learn about life in coastal villages, experience nature and tranquility as well as the wilderness. Others want to experience the excitement of driving charter boats, diving, surfing, go speedboating or hiring a boat and try their luck at fishing. Then there are those who want to sail from port to port and country to country on board gigantic cruise ships. The main workshop themes were how we meet the challenges of: 1) The development of marine and coastal culture tourism in Norway, Iceland, Greenland and the Faroe Islands, 2) Opportunities and threats, self sufficiency and environment – the effect of marine and coastal culture tourism and the image of the Northern Territories and 3) In what areas can we collaborate? There were also excursions where tourism related businesses and museums were visited. A lecture by author and travel writer Dr. Lawrence Millman, 13 March 2013, University of Akureyri. Punctuating his presentation with stories he collected and translated himself, Lawrence Millman took us on a journey that's at once personal, cultural, and geographical. He began with the West of Ireland and discussed storytelling and its traditional significance there, then he talked about his work in Greenland and the Canadian Arctic, where he spent several years collecting tales and myths from Inuit elders, and then he talked about the Kwakwadjec stories he collected in Labrador. Lawrence Millman has a Ph.D. in Literature from Rutgers University. He has taught at Haskoli Islands, Tufts University, the University of New Hampshire, Goddard College, and Harvard University. His 15 books include such titles as Our Like Will Not Be There Again, Last Places, A Kayak Full of Ghosts, Wolverine Creates the World, Lost in the Arctic, and -- most recently -- Hiking to Siberia. His next book, to be published in the fall, will be a collection of his essays about fungi. He was a Visiting Scholar at the Stefansson Arctic Institute. The Icelandic Greenlandic Arctic Science Days were held in Ilimmarfik, University of Greenland’s campus building in Nuuk, 21-22 September 2012. Proposed by The Icelandic Joint Committee on Arctic Affairs (under the auspices of the Icelandic Ministry for the Environment and Natural Resources) and organized by Stefansson Arctic Institute in collaboration with University of Greenland (Ilisimatusarfik) and Greenland Climate Research Centre (Silap Pissusianik Ilisimatusarfik), these inaugural Icelandic-Greenlandic Arctic Science Days were an opportunity for the sharing of knowledge and research results from the two scientific milieus of Iceland and Greenland, a venue for presentation of projects and building of partnerships for future collaboration. The program was composed of seminar presentations, plenary sessions, keynote lecture and discussions that provided an overview of current scientific activities and engagement in the Arctic and inform practitioners in the research community, policy makers and the concerned general public of the condition and prospects of Arctic research-related issues in the respective countries. SAI organized, together with the IASSA Council, the Seventh International Congress of Arctic Social Sciences entitled Circumpolar Perspectives in Global Dialogue: Social Sciences beyond the International Polar Year. ICASS VII was held at the University of Akureyri on June 22-26, 2011 and attracted 450 participants from 20 countries and included 52 sessions, five keynotes and six film screenings. The secretariat of IASSA was located at the Stefansson Arctic Institute 2008-2011, while Dr Joan Nymand Larsen was president of IASSA. On Thursday 24th September 2009 Dr Jón Haukur Ingimundarson, Stefansson Arctic Institute, will give a lecture on Iceland, Climate Change and the Friendly Arctic, during the Norwegian Science Week in Honningsvåg, Norway. This is also the day of the opening of an exhibit of photographs from Vilhjálmur Stefánsson's expeditions in the Arctic and texts from his diaries which the travelling exhibit The Friendly Arctic is based on. The photographs and diary texts are also available on the web. At the IASSA General Assembly on August 25, 2008, Dr. Joan Nymand Larsen, Senior Scientist at the Stefansson Arctic Institute was elected president of IASSA (International Arctic Social Sciences Association) for the next three years. The IASSA secretariat will be moved from Nuuk, Greenland, to the Stefansson Arctic Institute in Akureyri where it will be situated for the next three years. The 7th International Congress of Arctic Social Sciences will be held in Akureyri in the summer of 2011. The Stefansson Memorial Lecture of this year is sponsored by the Stefansson Arctic Institute in collaboration with the University of Akureyri and the Centre of Gender Equality. This event is in celebration of the Stefansson Arctic Institute’s tenth anniversary. Dr Gunhild Hoogensen, associate professor of political science at the University of Tromsø, Norway, will give this year's lecture which she calls Drill baby, Drill: from Energy to Human Security in the Circumpolar North. See abstract. The lecture is open to the public. (29th October 2008). To celebrate Stefansson Arctic Institute's 10th anniversary a web version of the Friendly Arctic Exhibition has been made in English, Danish and Icelandic. Photographs from Vilhjalmur Stefansson's excursions and extracts from his diary are also to be seen at Borgir (first floor), Nordurslod, Akureyri. Copyright © 2013 www.svs.is. All Rights Reserved.